THE CHRISTIAN LIFE — Christianity is not merely an accurate system of doctrine to be believed. It is also a supernatural life to be lived, experienced, and enjoyed by God’s people, both now and for all eternity. 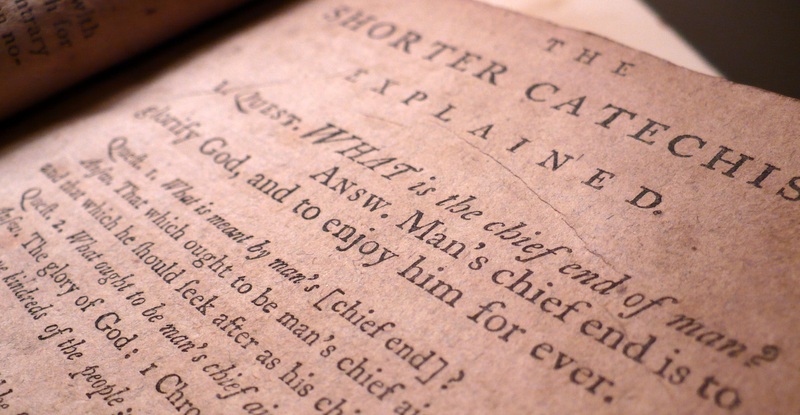 As the first question of our Shorter Catechism so beautifully states, “Man’s chief end is to glorify God and to enjoy Him forever.” The blessed life which Christianity offers, however, must be defined exclusively by God’s inspired Word, the Bible, which is our only infallible rule for faith and life. GOD’S MORAL LAW — Our Lord Jesus Christ once declared, “If you love Me, keep My commandments” (John 14:15). Elsewhere, He said, “Do not think that I came to destroy the Law or the Prophets,” making it clear that “whoever therefore breaks one of the least of these commandments, and teaches men so, shall be called least in the kingdom of heaven” (Matt. 5:17-19). The true Christian, therefore, can and must confess with the Apostle John that “this is the love of God, that we keep His commandments; and His commandments are not burdensome” (1 John 5:3). God’s revealed will for our lives (or “moral law”) is summarized in the Ten Commandments, which are as universally binding today as when they were first given at Mount Sinai (Ex. 20:1-17; Deut. 5:1-22) and later confirmed by our Lord and His apostles (Matt. 5:17-20; 22:35-40; Rom. 3:19). To humble them in the sense of their sin and misery, and thereby help them to a clearer sight of the need they have of Christ, and of the perfection of his obedience. To leave them inexcusable, and under the curse thereof, if they continue in the estate and way of sin. To provoke them to more thankfulness, and to express the same in their greater care to conform themselves thereunto as the rule of their obedience. In summary, God’s moral law shows everyone their desperate need for Christ’s perfect righteousness (Rom. 10:4), while at the same time urging justified believers to live a life of thankful obedience (1 Thes. 4:1-8; 2 Cor. 7:1). As Reformed Presbyterians, we readily affirm our Larger Catechism‘s helpful exposition of the moral law (Questions 91-150). To learn more about the fourth commandment and our duty to keep the Sabbath (or “Lord’s Day”) holy, click HERE. MORE THAN A LIST OF RULES — God has given us His moral law as our only authoritative rule of life and conduct. However, this fact must never be divorced from our intimate relationship to Him in the person of His Son, Jesus Christ. Nor should we overlook our utter dependance upon the sanctifying power of the Holy Spirit, by whom the Lord writes His law on our hearts. Pilgrims and sojourners, traveling by grace along the narrow way and running the race that leads to our heavenly home (Ps. 84:5-7; 119:32, 54; Matt. 7:13-14; 1 Cor. 9:24-27; Phil. 3:20-21; 2 Tim. 4:7-8; 1 Pet. 2:11; Heb. 11:9-10, 13-16, 35; 12:1-2). Rather than stressing law for its own sake, the Scriptures emphasize law-keeping as a fruit of genuine love for Christ (John 14:15). One might even dare to say (as is stated in the following sermon) that the “secret of sanctification” is to cultivate a deeper intimacy with the Savior, since it is by seeing and experiencing His glorious person that we are conformed to His glorious image (2 Cor. 3:18). THE KINGSHIP OF JESUS CHRIST — The Scriptures declare that our risen Savior and ascended King has been made “head over all things for the church” with “all authority in heaven and on earth” as “King of kings and Lord of lords” (Eph. 1:20-23; Matt. 28:18-20; Rev. 19:16). Christ is exalted in his sitting at the right hand of God, in that as God-man he is advanced to the highest favour with God the Father, with all fulness of joy, glory, and power over all things in heaven and earth, and doth gather and defend his church, and subdue their enemies; furnisheth ministers and people with gifts and graces, and maketh intercession for them. As the enthroned King, Priest, and Prophet of His Church, Christ must be honored by all and above all. This means that all mankind has a duty to believe on Him, worship Him, and observe His moral law in every sphere of life and vocation (e.g. family, church, and society). No aspect of life may be divorced from Jesus Christ as Savior and Lord, since “all things were created through Him and for Him… that in all things He may have the preeminence” (Col. 1:16, 18). No nation that hears the gospel is exempt from these duties (Ps. 2:10-12). The more any nation enjoys the saving blessings of King Jesus, the more its corporate life will conform to the spiritual priorities and ethical principles of His Word. Parents will become Christian parents; magistrates will become Christian magistrates; citizens will become Christian citizens; all will serve to advance His glorious agenda of grace and salvation in the world. Of course, this does not mean that the family, the church, and the state may be equated or confused. While all three must cooperate for the advancement of Christ’s kingdom on earth, each has its own God-ordained sphere of operation that must remain distinct. One institution may, according to its own proper jurisdiction, insist that the others obey Christ, but it may not replace them or attempt to perform their unique God-given function. For a systematic, Scriptural, and confessional explanation of this doctrine, we recommend listening to our pastor’s Theological Foundations lesson entitled, Christ’s Mediatorial Kingship, along with its sequel, Christ-Centered Voting. Copyright © 2014, Southfield Reformed Presbyterian Church. All Rights Reserved.